They call it the Florence of the south, but the city of Lecce, in the tip of Italy’s heel, is so much more flamboyant than that. Its old town is a parade of limestone palazzos, wildly ornate churches and elegant marble-flagged squares, preserved in a bubble of 17th-century architectural perfection. And, this summer, it’s become as trendy as it is beautiful, thanks in part to the arrival of two boutique hotels, a handful of high-end restaurants and a pile of fashionable bars. Not to mention some pretty good shopping. History first. 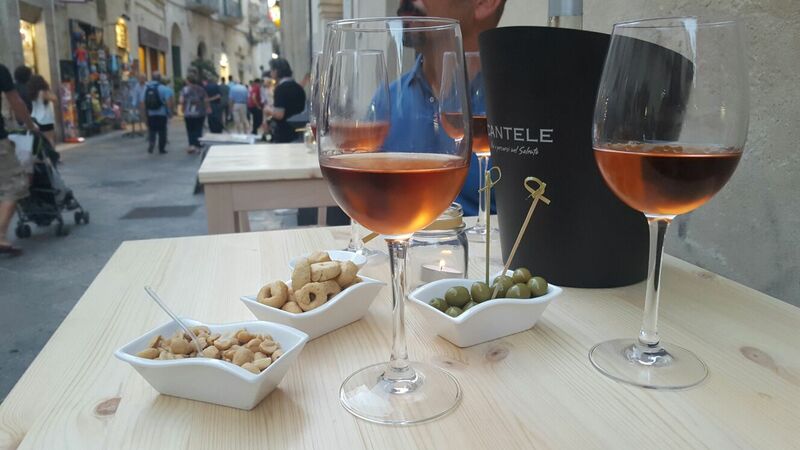 “Lecce’s story is that cultural cross-contamination common to so many southern towns,” Sambati says. That means a little bit of Greek, a smattering of Roman, then the Ostrogoth-Norman-Sicilian mishmash that culminates in the baroque explosion of the 17th century. But nowhere does it better than here. 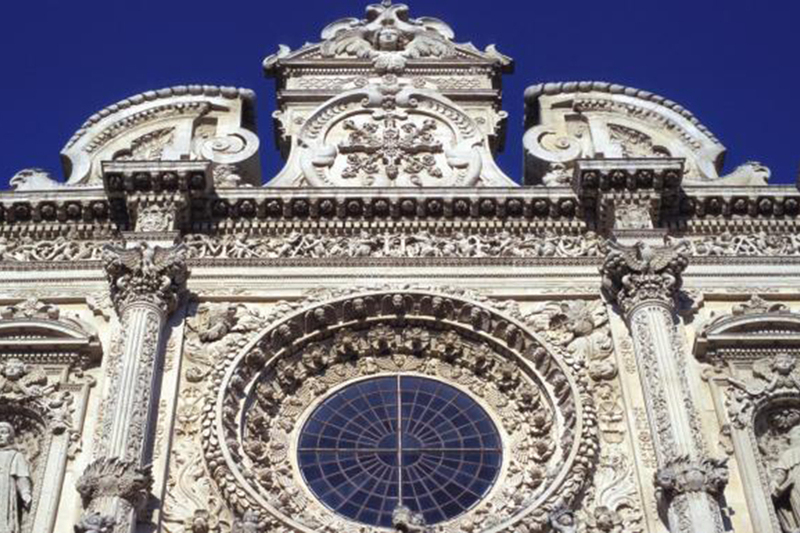 My first day is dedicated to admiring the city’s singularly flamboyant style, so important, it has a classification all of its own: barocco leccese, officially the baroquest of curly baroque. I start with Giuseppe Zimbalo’s insane Basilica di Santa Croce — described by one 18th-century cultural commentator as “the nightmare of a madman” — which has allegorical monsters swarming across the facade; then the more restrained Duomo, with its glorious wooden ceiling. But of the 100 — yes, 100 — churches in the old town, the loveliest moment of all comes courtesy of the cloister of the Chiesa del Carmine, open to the public quite when I can’t work out. With a word in the priest’s ear, €2 for a candle and a special prayer, I’m allowed into its dappled shade for 10 minutes of perfect peace. The gorgeousness continues at Must, a gallery converted from the monastery of Santa Chiara, where the lower floors are given over to contemporary Italian art (£3.50; mustlecce.it). Cosimo Carlucci’s modern sculptures provide a breather from the baroque, and Armando Marrocco’s Cor-Ten monoliths in the courtyard couldn’t be more elegant: ideal entertainment while the city beds down for a three-hour snooze. That siesta is the downside for shoppers, as most of Lecce’s lovely little boutiques close their doors between 1pm and 5pm. What that does mean, however, is that I can take my lunch as seriously as the locals do. Of the city’s top-notch new restaurants, Blu Notte is one of the best: a deceptively plain cluster of tables on a corner terrace by the city wall, shrouded from the midday sun by heavy cotton drapes. The fish is outstanding: tuna carpaccio with Gallipoli prawns, followed by spaghetti with sea urchins (mains from £10; ristoranteblunotte.com). After 5pm, the passeggiata begins in earnest. This is traditionally the time when Italians walk out and shoot the breeze, and the Leccesi are no exception, kicking off on Piazza Sant’Oronzo — conveniently close to Natale, the best gelateria in town, where the bestsellers include fig and ricotta and chilli and chocolate (from £2; natalepasticceria.it) — and strutting their stuff the length of Via Vittorio Emanuele II, all the way to Porta Rudiae, the magnificent city gate. On the way, there’s shopping to be done. The narrow, marble-flagged streets are dotted with the kind of artisan stores Primrose Hill girls would kill for: the brand-new Vico dei Bolognesi stocks Marni-style coats, linen totes and funky sunglasses (Via Giacomo Matteotti 22a); 4uattro does one-off ceramic rings by Monica Righi, as well as architectural jewels by Maria Paola Barrotta and Tegumenti (Via Arcivescovo Petronelli 12); and IJO has exquisite hand-loomed frocks (Via Giuseppe Palmieri 47). 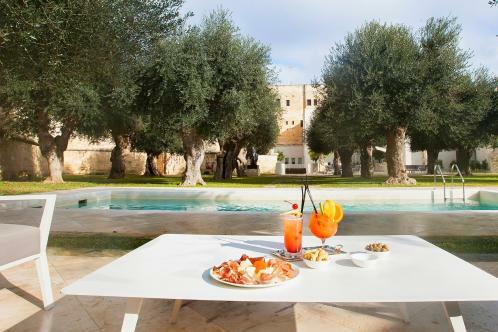 Ahead of dinner, I check in at the first of Lecce’s chichi new hotels: La Fiermontina, a 16-room resort built into the walls of the old city, owned by the French-Moroccan brother-and-sister team Giacomo and Antonia Filali. Their astonishing art collection — Léger, Corbusier, Zwobada — is dotted around a set of buildings updated by the Hermès family architect Antonio Annicchiarico from a 17th-century villa. Interiors are a mix of slick midcentury and traditional Pugliese, and there’s a neat little pool in the garden — unheard of in the old town. This is just the kind of place where you should let the kitchen choose for you: I end up with Simone Solido’s signature dishes, red prawn carpaccio with citrus oil, spaghetti with mullet roe and seared john dory with chicory and beetroot. It’s not far to roll home: about 20 yards, in fact, into a suite with a bed big enough for four and a terrace that looks out onto two of Léger’s pert sculpted bottoms (mains from £14; doubles from £190; B&B; 00 39 0832 302481, lafiermontina.com). Masseria Trapana is the second of the city’s cool new hotels, a 16th-century farmstead on the outskirts, surrounded by 60 hectares of olive groves, that’s been transformed by an Australian hotelier, Rob Potter-Sanders. Puglia had always been his dream. He opened at Easter after two crazy years of rebuilding the farmhouse from a ruin. “The learning curve was vertical,” he says. With a career in some of the world’s luxiest hotels behind him, Potter-Sanders has carved nine immaculate suites out of tufo stone, with vaulted ceilings, vast terraces and canopied iron bedsteads. The vast gardens grow 19 types of fruit and nut, and swifts swoop down to drink from the swimming pool at dusk. Next, he plans to turn the underground olive press into a cinema and spa (doubles from £215, B&B; 00 39 0832 183 2101, trapana.com).